alaTest has collected and analyzed 15 reviews of ARCADE Orbit Cam XL Drone with Controller - Black. The average rating for this product is 2.7/5, compared to an average rating of 4.0/5 for other Camcorders for all reviews. Reviewers really like the usability. There are some less positive opinions about the portability and battery. Comments are divided on the price. We analyzed user and expert ratings, product age and more factors. Compared to other Camcorders the ARCADE Orbit Cam XL Drone with Controller - Black is awarded an overall alaScore™ of 82/100 = Very good quality. Returning it because it didn't work. 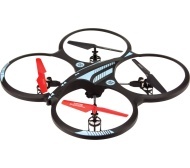 Fantastic gift and starter drone for my brother who has always wanted one. Maybe provide an additional battery, or sell batteries individually. It doesn't work sand i'll be sending it back. the bottom right propeller doesn't create enough lift to enable the thing to take off.